H&M will collaborate with Italian label Marni on a new limited-edition spring 2012 collection for men and women. The Marni collection is the latest designer collaboration for H&M, which has previously collaborated with brands such as Karl Lagerfeld, Stella McCartney, Comme des Garçons, Jimmy Choo, Lanvin, and most recently Versace. The popular Swedish high-street retailer offers high-fashion at affordable prices as the range will be created by Marni Founder and Creative Director Conseuelo Castiglioni. The collection will feature for the women: vivid colours and bold prints, full pleated skirts, dresses, accessories, cropped trousers and jacquard knits in a range of African-inspired silk and cotton fabrics. For the men: the use of print is more subtle, often as a lining or as a contrast detail for shirts, while the silhouette offers a modern take on masculine classics. 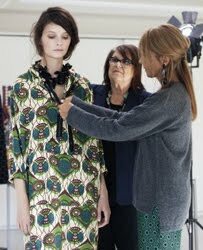 “I wanted to create a true Marni wardrobe by revisiting all our favourite pieces in signature fabrics and prints. As always, I love juxtaposing prints and colours, mixing modern tribal with Bauhaus graphic adding sporty utilitarian elements” Castiglioni commented about the collection. The collection will be available from 8 March 2012 in around 260 stores worldwide and online www.hm.com Do you enjoy the designer collaborations with H&M? I have bought a few things from the Versace collaborations. Other than that, I have only saw the Sonia Rykiel and Matthew Williamson ones, and they looked crap. Hopefully the Marni one will be good quality!